From his obituary [Columbus Dispatch, The (OH) – Sunday, May 21, 2000]: "He enlisted as a cadet in the Army Air Corps during the Second World War in 1943, and served until 1946. He attended Ohio University in Athens studying pre-law 1946-1948, and graduated from The Ohio State University College of Law in Columbus in 1953." From his obituary [Atlanta Journal-Constitution, The (GA) – Saturday, June 1, 2002]: "was an instructor pilot for the U.S. Air Force". He graduated from Spence Fld, Ga. S/N: O-839344. 1st Lt. He had basic at Greenwood, MS. Graduated as a bombardier with the Class of 45-11 at Big Spring AAFd in Texas on May 3, 1945, S/N: T-145423. Fred Briles was his instructor at Douglas. He graduated from Spence Field, Ga. S/N: O-839345. 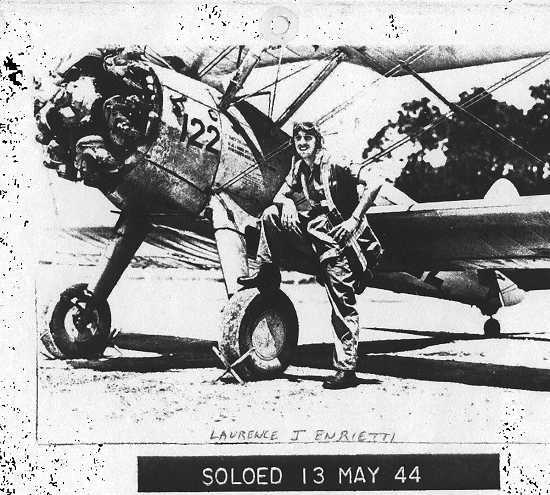 He served in the Pacific Theatre on Guam and Japan flying P-47’s and P-51’s. Retired from Reserves as a Major. He graduated from Columbus, MS. S/N: O-839710. His service was all in the U.S.A. He was in B-26 transition when the war ended. 2nd Lt.
Mike Sewell, Sandy Davidson and Higginbothan were his instructors at Douglas. He had Basic at Macon, Ga and graduated from Columbus, Miss. He went to Boise and Walla Walla, Wa. and was in B-24’s. He was sent to Germany in 1946. 1st Lt.
From his obituary [South Bend Tribune (IN) – Wednesday, November 22, 2006]: "a pilot in the Army Air Force…An avid pilot based out of Smith Field, he performed in many air shows throughout the state." S/N: O-838485. He was shot down in Korea in 1950. He was flying P-51’s when he was killed. Hayne Workman was his Instructor. He had Basic at Cochran and Advanced at Columbus, MS. S/N: O-839723. He went to Laredo, TX. for transition to B-24’s. Later was checked out on B-17’s and C-46’s. Next he flew Bomber Cadets in AT-11’s at Big Spring, Texas. He stayed in the Reserve until 1957. He graduated from Columbus, Miss. He served in the continental U.S.A. (none overseas). 1st Lt.
Died ca. May 18, 1992, Age 69. Bill Dillard was his Instructor. He graduated from Spence Fld, GA. F.O. S/N: T-67412. He had basic at Cochran, GA and Advanced at Spence Fld, Ga. Flew B-25’s to the Phillipines where he was assigned to the 42nd Bomb Gp. Went to Korea from there flying C-47’s. Stayed in the Reserve and retired as a Lt. Col.
Shelton was his Instructor at Douglas. He graduated Advanced at Columbus, Miss. 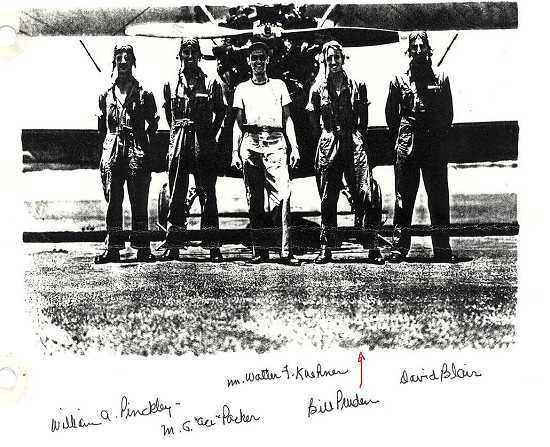 Lt. Col.
Wesley Shelden was his Instructor. He took Basic at Macon, Advanced at Columbus, Miss. He stayed in the Reserves and retired as a Lt. Col.
Sheldon was his Instructor. He graduated from Spence Field, GA. S/N: O-839351. He was ready to go over seas, but the war was over. Later he was in occupied Germany for some time. He flew 100 missions during the Korean War. Lt. Col.
Jose Oliveros was his Instructor. He had Basic at Gunter Fld, AL and he graduated from Spence Fld, GA. S/N: O-833352. He went into Fighters. After the war he flew multi-engine. He had Basic at Macon, GA, Advanced at Columbus, Miss. From his obituary [York Daily Record (PA) – Monday, September 28, 1992]: "A second lieutenant with the World War II, he was with the 2512th AAFBU." He was a bombardier graduate at Childress Army Air Field located near Childress, TX. He was a member of the Class of 45-17 (June 13, 1945) and had the serial number O-2090730. From his obituary [News-Sentinel, The (Fort Wayne, IN) – Friday, November 19, 1999]: "a World War II Army Air Corps and Korean War U.S. Air Force veteran." From his obituary [Chicago Tribune (IL) – Sunday, May 11, 2008]: "He was a veteran of the U.S. Army Air Force." He graduated from Columbus, Miss. Then was a Co-Pilot on B-24’s and B-17s. He also flew Bombardier Cadets in AT-11’S. He instructed for 18 months after discharge for a local flight operator. Then he went to work with the C.A.A. / F.A.A. (with time out to go to Korea) until he retired in 1976. Then he did full time Corporate Flying until 1986. 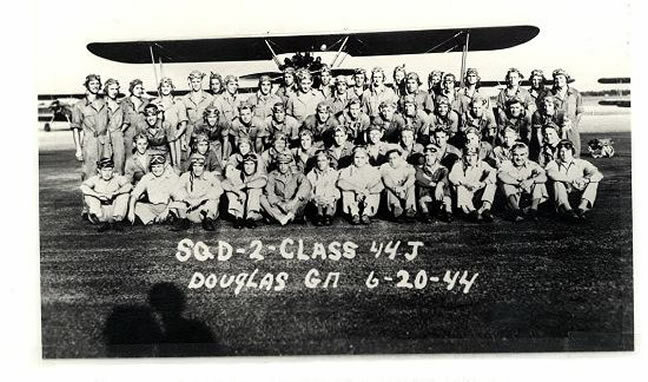 He was in Squadron 2 at Douglas (see photo at top of page). Thomas graduated from Columbus, MS. He served in the USA and in cold Weather Testing in Alaska. He was discharged in 1946. 2nd Lt. He graduated from Spence Fld, GA. S/N: O-839356. At the end of the war his sqdn. was given a leave. He drowned while swimming on this leave. 2nd Lt. He graduated from Columbus, MS., S/N: T-68926, with class 45A. From his obituary [Tabor-Loris Tribune (Tabor City, NC) – Wednesday, April 28, 2010]: "He retired in 2002 from serving pastoral ministries since his graduation from Union Theological Seminary in 1955. He served the Tabor City Presbyterian Church and the Loris Presbyterian Church from 1974 through 1987." Born in Reidsville, SC on April 19, 1925. From his obituary [Press of Atlantic City, The (NJ) – Friday, February 1, 2013]: "He proudly served in the U.S. Army/Airforce. Jack piloted the P-47 Thunderbolt, fighter bomber, during World War II. After the war he joined the family business, Darreff Inc., installing the patented ‘Darreff Miracle Flow Beer System’ for fifty years." He had Advanced at Columbus, Miss. He graduated from Spence Field, GA. S/N: O-839360. He served in WWII. 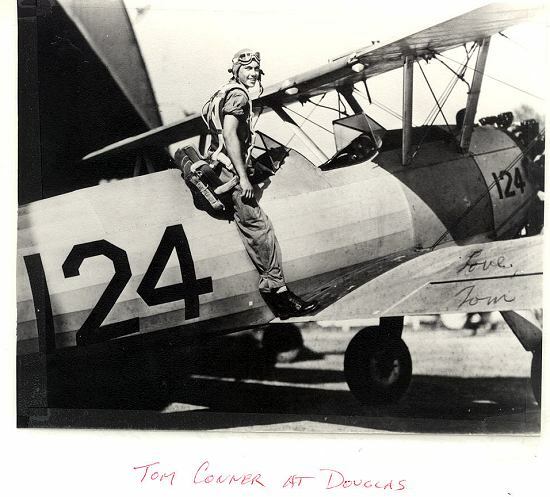 After The war he started instructing flying at Crawfordsville, IN. until recalled for the Korean War flying P-51’s and F-86’s. He also took part in the Vietnam conflict flying the C-2 Caribou. He had a 26 year Air Force career. Lt. Col. He graduated at Spence Field, GA. He served with the 15th Fighter Group 47th Fighter Squadron in the Central Pacific as a 1st LT. He had Basic at Macon, GA, Advanced at Columbus, MS. S/N: O-839745. From his obituary [http://www.grecohertnick.com/]: "He was commissioned a Second Lieutenant in the United States Army Air Corps, serving in combat as a bomber pilot during World War II." Born October 11, 1924 in Hollidays Cove, WV. Bill Dillard was his instructor. He graduated from Columbus Miss. He flew bombers. He was based in the U.S.A. but made many flights outside the country. He stayed in the Reserve. After the war he attended an Aeronautical School. 1st Lt. He dislocated his shoulder in P.T. at Douglas. This caused his release from flight training while in Advanced flight school. He continued to fly as a civilian pilot, in his business as a Special Machine Design Engineer. He built his own biplane and flew it. Graduated as a bombardier with the Class of 44-42 at Childress AAFd in Texas on November 14, 1944 (S/N: O-2073494) and crewed on B-26s with the 397th Bomb Group in Europe. James graduated from Columbus, MS. S/N: O-839749. Later was flying B-25’s. Later was in Helicopter Rescue. Jake Byington was his instructor. He had Basic at Cochran, GA and graduated from Spence Fld, GA. as a F.O. They were held there an extra 6 weeks as the war was nearly over and there was no place to send them. He became a Co-Pilot on a B-25. They assembled a crew but the war ended 2 days before they were to leave for overseas. 2nd Lt.
Fulton, Fitzhugh L. Jr. "Fitz"
He had Basic at Cochran Field, GA and graduated from Advanced at Columbus, Miss. He served in B-24’s. He was discharged when the war was over. From his obituary [http://obituaries.triblive.com/listing/84961/Raymond-Gegick/]: "a World War Army Air Forces veteran"
He graduated from Moody Field, GA. Then was a Co-Pilot on B-24’s. By the time he had his crew together and had gone to Westover, Mass, and a B-29 school, the war was over. 2nd Lt.
From his obituary [St. Petersburg Times (FL) – Friday, September 19, 1997]: "He was an Army Air Forces veteran of World War II"
Had Basic at Cochran, GA and graduated from Spence Fld, GA. He flew numerous airplanes during his career including the F-104A Starfighter, but his favorite was the P-51 Mustang. He retired from the South Carolina Air National Guard as a Lieutenant Colonel. Wife of 72 years: Alene. Died November 24, 2018, age 93. He graduated as a bombardier with the Class of 45-17 at Childress AAFd in Texas on June 13, 1945. From his obituary [Patriot-News, The (Harrisburg, PA) – Thursday, July 6, 1995]: "He retired as an engineer from the Steelton Plant of Bethlehem Steel Corp.; was an Army Air Corps veteran of World War II; and a member of Calvary Orthodox Presbyterian Church, Middletown." Died July 6, 1995, Age 74. Truman Witt was his Instructor at Douglas. Bill had Basic at Macon, GA and Advanced at Moody Fld, GA (graduated with S/N: O-839587). He flew B-17, B-24, B-25 and B-29’s. He was a VIP pilot for a time. After he retired from the USAF, he was a pilot for a Swiss airline. Then went to Africa as a mercenary pilot. Lt. Col. Per his obituary [Miami Herald, The (FL) – Sunday, May 3, 2009]: Immediately upon graduation he enlisted in the United States Army Air Corps to fight in World War II. He flew a P-51 mustang fighter plane being an excellent pilot. 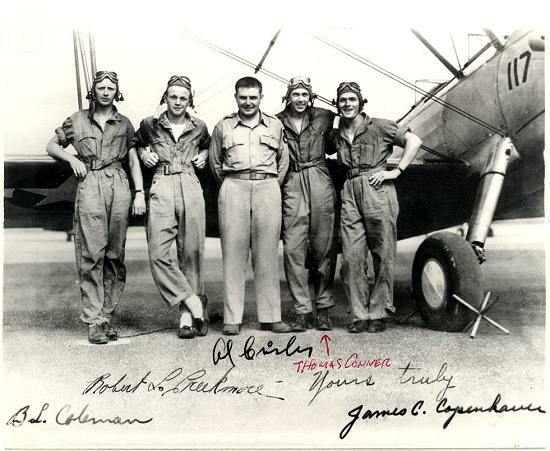 After the war, Mallory continued to serve in the United States Air Force and Air Force Reserve, being later honorably discharged at the rank of Captain. He had basic at Macon, GA and graduated from Spence Field, GA. He graduated from Spence Field, Ga. S/N: O-839372. He flew P-51’s. 2nd Lt. He graduated from Spence Field, Ga. S/N: O-839375. He was a bombardier graduate at Childress Army Air Field located near Childress, TX. 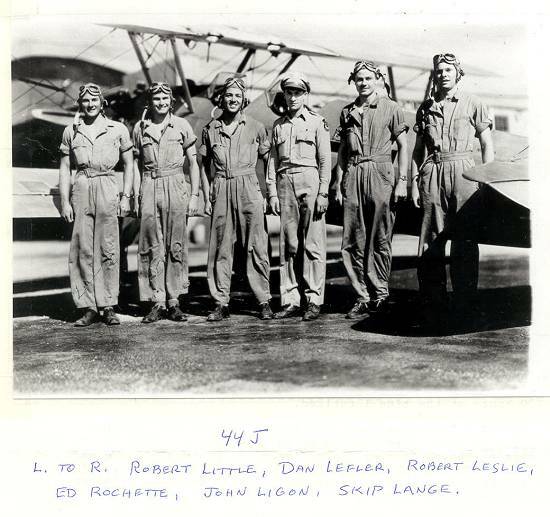 He was a member of the Class of 44-50 (December 9, 1944) (S/N: T-140731) F/O. From his obituary [Kentucky Post, The (Covington, KY) – Wednesday, July 20, 1994]: "He was a retired major in the Air Force and a veteran of World War II, the Korean War and the Vietnam War. He was a member of Retired Officers Association, Strategic Air Command, the American Legion Post in Elsmere, KY"
Bill Thy was his Instructor. He became a Flight Engineer on B-29’s. The war was over before he was shipped overseas. Graduated from Spence Fld, GA. From his obituary [Las Vegas Review-Journal (NV) – Thursday, February 1, 2007]: "served in World War II as a P-51 fighter pilot. Upon leaving Ohio, Mike moved to Los Angeles, where he owned and operated an airline company out of LAX." He owned and operated a fixed and rotary wing flight school. Basic at Cochran, GA and Advanced at Moody Fld, Ga. “Skip” was just finishing operational training in B-51’s when "VJ Day" was declared. 2nd Lt. 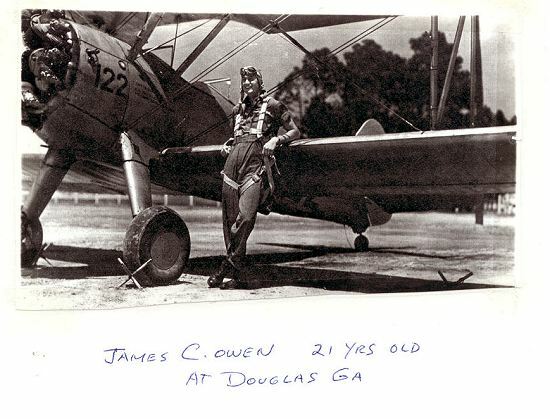 He graduated at Moody Field, GA. Then flew in N. Africa in 1946 in a C-47 and C-54 airplanes. He joined the N.Carolina National Guard in 1953 and retired 18 years later. He has 5200 total hours of flying. Lt. Col.
2LT. He was a grad with the Class of 44K at Moody Field (S/N: O-840389 ). From his obituary [Daily Times, The (Maryville, TN) – Thursday, December 30, 2010]: "After volunteering for military service in the Army Air Corps in 1943 — where he was a bomber pilot and flight instructor — he received a B.A. from Iowa State University in Animal Science in 1948." Per his obituary [St. Petersburg Times (FL) – Thursday, July 11, 1991]: "During World War II, he served in the Army Air Forces and retired as a major. Locally, he was a member of Veterans of Foreign Wars Post 6827, American Legion and Disabled American Veterans." Died July 9, 1991, age 66. He graduated from Moody Field, GA. He served in the U.S.A. flying B-24’s. 2nd Lt. He graduated from Spence Field, GA. S/N: T-67435. He was assigned to Lincoln, Neb. Then to Dale Mabry. He flew B-51’s. The war ended and he was discharged. He soon re-enlisted and stayed in the Service for 23 years. Retired as a Senior Master Sgt. Then he worked at the Naval Air Station at Pensacola until retiring there. From his obituary: [Morning Call, The (Allentown, PA) – Sunday, July 15, 2012]: "Serving with the Army Air Corps during World War II, Robert earned the rank of staff sergeant." Died July 13, 2012, age 90. Al Cross was his Instructor at Douglas. He graduated from Spence Field, GA as a F.O. S/N: T-67440. He served in the U.S.A. flying P-51’s and was based at Thomasville, GA. 1st Lt.
From what is probably his obituary [Milwaukee Journal Sentinel (WI) – Monday, October 17, 2005]: "Neil honorably served in the Army Air Force as a B-17 navigator with Division 15 and flew 246 hours and 50 missions from Natousa, Italy." Glenn Harrington was his instructor at Douglas. He graduated from Spence Field, GA. S/N: O-839399. He was ferrying airplanes. In 1947 he was forced down, Jumped too late. 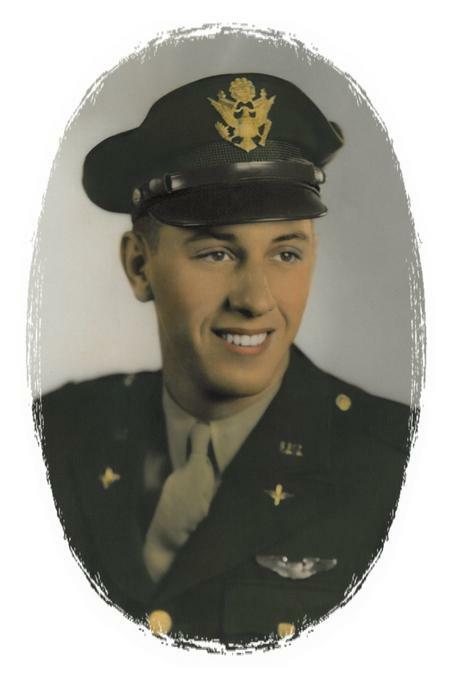 1st Lt.
From his obituary [Kansas City Star, The (MO) – Wednesday, February 23, 2011]: "He served in the Air Force from 1943 to 1945 as a Second Lieutenant. He flew B-24s and did training with B-29s in Roswell, NM." S/N: O-839618. He was a B-17 pilot assigned to Lincoln AAFd for staging towards the war. From his obituary: [Miami Herald, The (FL) – Sunday, October 16, 2011]: "Prior to joining the U.S. Army in 1941 he was a Locomotive Fireman. During his service in the Army he served as a Flight Officer and Engineer, and was awarded several awards and citations. Upon returning to Buffalo he went to work in the steel mills and was also a civilian flight instructor. In July 1957, Connie moved his family to Miami, Fl. He started working for Dade County in the 1960’s. Connie was the Auxiliary Airport Manager at Tamiami Airport and the Training & Transition Airport on the Dade- Collier County border. He was promoted to Chief Airfield Supervisor at Miami International Airport in the 1970’s." Basic at Cochran, GA. Advanced at Moody Fld, GA. He went into B-17’s and was ready to leave for Europe and the war in Europe ended. Then he went to B-29 Co-Pilot school. He was ready to go to the Pacific and they dropped the Bomb. 2nd Lt. 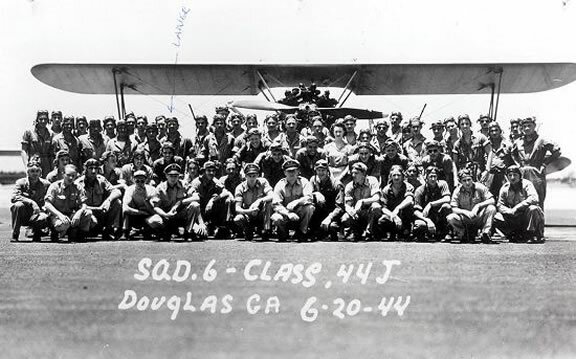 He graduated as a bombardier with the Class of 44-42 at Carlsbad AAFd in Texas on October 14, 1944, S/N: O-788075. He served with the 30th Bomb Group 38th Bomb Squadron. He graduated from Twin Engine school. He graduated from Spence Field, Ga. S/N: T-67444 as a flight officer. He served as a B-25 pilot with the Air Transport Command based at Finschafen in New Guinea and was killed in a flying accident there on July 19, 1945, where he went missing. From his obituary [http://www.obriensullivanfuneralhome.com/]: "Proud member of the US Air Force Lt. Col. Ret." He graduated from Moody Field, GA. He served for 3 yrs. 6 mo. and 4 days in the Training Command. 2nd Lt.
From his obituary [Connecticut Post (Bridgeport, CT) – Sunday, October 19, 2008]: "was a veteran of the U.S. Army Air Corps"
Went to Advanced Training at Spence Field, GA, S/N: O-839411. Records show he was a Captain in the USAF reserves in 1958. From what is probably his obituary [Star-Tribune (Casper, WY) – Friday, May 18, 2012]: "He served in WW2, Korea, and Vietnam as a fighter pilot in the United States Air Force. Flying over 100 missions in Korea, he was awarded the Distinguished Flying Cross and received the Bronze Star for his actions in Vietnam. Airframes he flew included the P-52 (sic – probably P-51), F-86, F-102, and F-4." Retired as a Colonel. Died May 12, 2012 in Jacksonville, FL. He went through Replacement Training in the P-47 at Millville Army Air Field , NJ. From what may be his obituary [Times, The (Trenton, NJ) – Friday, September 17, 2010]: "He was a veteran of the Army Air Corps, serving with the 59th Reconnaissance Squadron during World War II." From what is probably his obituary [Post and Courier, The (Charleston, SC) – Thursday, November 10, 2005]: "He retired as Lt. Col. of the U.S. Air Force Reserves"
Sandy Davidson was his instructor. 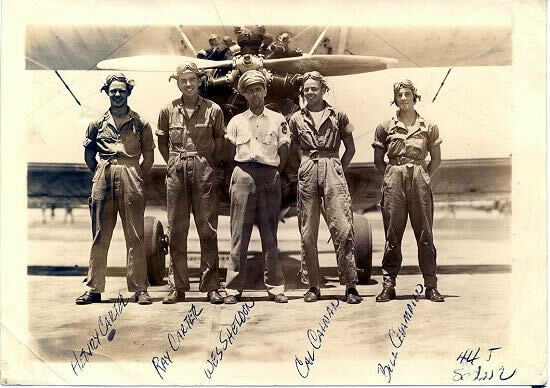 He graduated from Moody Field, GA. he became a B-24 Co-Pilot. He was sent to crew assembly, then to A.T.C. He flew B-17’s. Then the war was over and he did not get over seas. He had Basic at Cochran Field, Ga. Then was discharged. He had Basic at Macon, GA and graduated from Moody Field, GA. He Served in WWII and in the A.F. Reserve. 1st Lt.
From his obituary [Chicago Tribune (IL) – Friday, January 28, 2005]: "former Fire Chief for the Pleasant View Fire Department"
Died Jan. 25, 2005, age 85. From his obituary [Hartford Courant, The (CT) – Wednesday, October 30, 2013]: "Win had a love of flying which led him to obtain a private pilot license at a young age. During World War II, he proudly served in the Army Air Corps where he earned his ‘wings,’ an achievement in which he took great pride. 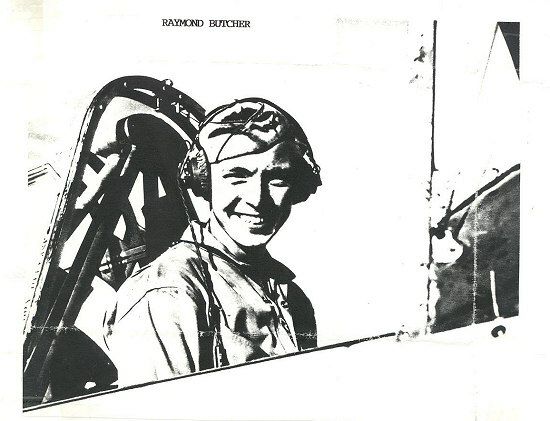 After the war, he returned to work at Pratt and Whitney Aircraft." From his obituary [Plain Dealer, The (Cleveland, OH) – Wednesday, May 25, 2011]: "Jack served in the U.S. Air Force and was a proud graduate of University School in Shaker Hts. as well as Cornell University." From his obituary [Whittier Daily News, The (CA) – Tuesday, January 5, 2010]: "Randall Lake Williams ‘Randy’ — he enlisted in the United States Army Air Corps and was commissioned 2nd Lieutenant, December 1944. He was a B-17 Pilot." From what is probably his obituary [NewsTribune (La Salle, IL) – Monday, November 1, 2010]: "He served in the U.S. Army Air Corps during World War II as flight instructor." Died Oct. 31, 2010, in a Spring Valley, IL hospital.